After connecting, go to Settings > Policies > Groups > [Policy Name] > Categories to see the accounts imported from QuickBooks Online. Use the enable/disable button to choose which Categories to make available to your employees, and set Category specific rules via the blue settings cog. If necessary, edit the names of imported Categories to make expense coding easier for your employees. 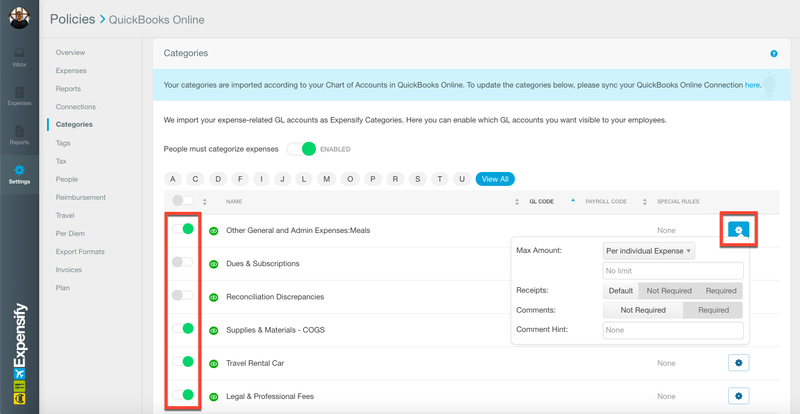 (Please Note: If you make any changes to these accounts in QuickBooks Online, the category names on Expensify's side will revert to match the name of the account in QuickBooks Online the next time you sync). If you use Items in QuickBooks Online then you can also import them into Expensify as Categories. Please note that each expense has to have a category selected in order to export to QuickBooks Online. The selected category has to be imported in from QuickBooks Online and cannot be manually created within the policy settings. 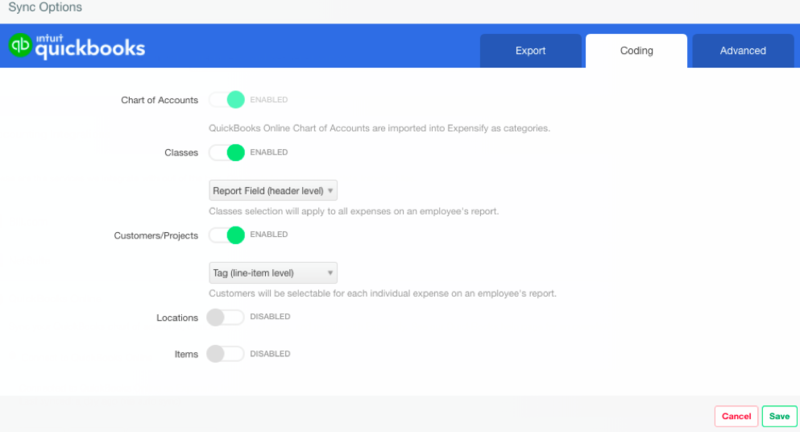 Report Fields lets you apply a Class and/or Customer/Project to all expenses on a report. Locations can be imported into Expensify as a Report Field or, if you export reimbursable expenses as Journal Entries and non-reimbursable expenses as Credit/Debit Card then you can choose to import Locations as Tags. If you use Items in QuickBooks Online then you can import Items defined with Purchasing Information (with or without Sales Information) into Expensify as Categories. Please note that tax cannot currently be exported to Journal Entries in QuickBooks Online. For more information on Tax with QuickBooks Online click here. Expensify will initiate a daily sync, keeping your information current and reducing errors caused by out-of-date QuickBooks Online data, as well as saving you time with syncing.